Are You Sure You're Hiring the Right Lawn Care Company? Okay, so the picture on the right here isn't real. However, it demonstrates a powerful fact in this industry; if you live in Columbus, have a spreader and a bag of fertilizer, you too can be a lawn care company. For some lawn care companies, the thought is to forget about any training, all they need is a spreader and some fertilizer. What's my point? Well, I have some knives at home, so can I perform surgery? So when choosing a lawn care company to take care of your lawn, or a surgeon for that matter, make sure that you choose somebody with a little bit of training. Let me start by using this disclaimer because I have a lot of friends that are Landscapers: "Not every landscaper is unqualified to spread fertilizer." But having said that, there is a lot that are not. It's a common misconception that when someone needs their lawn fertilized a landscaper can handle it. The problem is that most landscapers do not receive the special training needed to be licensed in lawn care. Most figure that they dump some fertilizer in a spreader and away they go! However, a lawn is a living thing that develops different issues and illnesses that only some one licensed in it's care can accurately diagnose and care for. Better yet, someone that doesn't know what they're doing could overdose your lawn on fertilizer and harm it! For example, a customer recently told me that they had a landscaper taking care of the lawn for the past four years. However, they weren't happy because their lawn had a yellowish-hue to it that had never went away. They finally decided that they had enough and signed up with Weed Pro's Deluxe Lawn Care Program. The customer went on to tell me that when our licensed technician showed up to apply their first treatment, he went straight to the door to deliver an important message. "Did you know that your lawn mower blades were dull," the technician told him. "That's why you have a yellowish-hue on the tips of your grass. The blades are ripping the grass, not cutting them." Astounded the customer went on to tell me that after sharpening their blades and two fertilizer applications, he now had the best looking lawn on the block. Just remember, that sometimes it's not what a company can do, but it's what they know. So how do you know if a company has technicians that know what they're doing and have a understanding of lawn care? Simply check with the State of Ohio's Department of Agriculture to make sure that your lawn care provider has a licensed to apply lawn care products. Having a licensed lawn care applicator is your best protection against someone who doesn't know what they're doing. A Doctor that Uses a Dull Knife vs. State of the Art Laser... Which Would You Choose? Equipment is another major factor in choosing a lawn care company in Columbus. Yes, technically all you need is a spreader; however lawn care companies that use ride-on spreaders can apply fertilizer more accurately, with less chances of applying too much (or too little) lawn care products, harming the overall health of your lawn. These lawn care spreaders use mechanisms based on how fast it's moving to deliver the proper amount of fertilizer to your lawn. 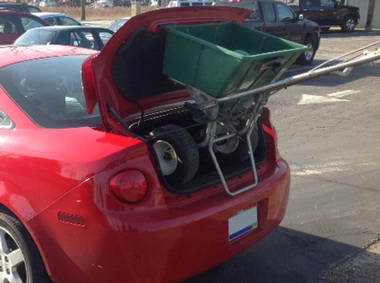 So unlike a push spreader, their is always the right amount being applied to your lawn. Download The Perfect Hiring Guide! So the moral of this story is that they're a lot of companies out there that shouldn't be applying fertilizer to your, or anyone else's lawn. We're not saying that you should just hire us because we just told you that, but it's our hope that you use the information we gave you when hiring a lawn care company in Columbus. But to really help you out, we've put together ALL THE QUESTIONS YOU SHOULD ASK when HIRING A LAWN CARE COMPANY. Best part is that it's absolutely FREE! All you have to do is click the button below to download your free copy!